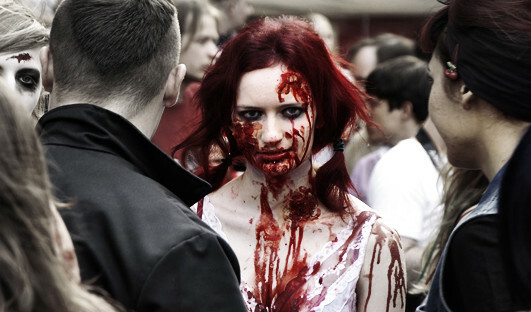 Planning to join your town’s annual zombie walk or zombie costume party? Well, you can’t go there looking like a human being! Bring out your face paint, make up, ketchup, saw and hammer (just kidding), old rags, contact lenses, powder, coal, grease and whatever you can find to make you look as hideous as possible. To help you out, we’ve collected 37 Zombie photos that feature gruesome costumes of sick (in a good way…I think) people at zombie themed pictorials and zombie walks around the world. Be frightened, be inspired and be zombified by this nasty collection! If I die before I wake….